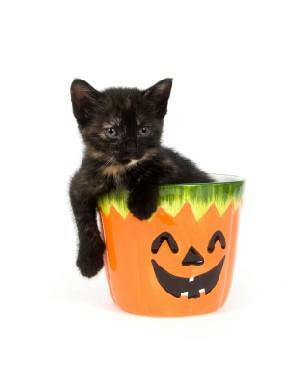 As much fun as the holiday is for humans, it's important to be aware of some major Halloween dangers for felines. Owners of black cats, in particular, need to consider their pet's safety on this fun-filled night. If you own a cat that is black or a black color combination, it would be best to keep them in the house. Unfortunately in this enlightened day and age, there are still persons who kidnap cats around Halloween and sacrifice them in cult rituals. Your cat is much safer indoors. There are other dangers to your feline friend. If you are not already aware, chocolate and raisins are toxic to cats. Excess amounts of sugar are not good for cats either. If the kids drop a piece of candy, and your cat gets hold of it, it could become stuck in his mouth. Make sure your decorations are pet friendly too, by removing loose strings and dangly things that your cat could get caught up in. Stay away from decorations that are too small and could get lodged in your cat's mouth, they can block your cat's airway and he or she could suffocate. On the lighter side, you can dress up your cat for Halloween. Companies make a full assortment of costumes for pets today. If you would like to dress up your cat for Halloween and have never dressed up your cat before, you should be aware that Ms. Munchkin may not sit still for what she feels is nonsense. So try and be sensitive to the cat's wishes. If a feline is unhappy he or she will let you know. When picking a costume, make sure that there are no strings hanging or parts of trim that could distract your cat and make them want to chew on the costume. Make sure that the costume fits loosely enough that it doesn't bind, but not so loose that it will fall off your cat, or trip him when he is walking. If the costume comes with a mask, make sure that the eyeholes are large enough for your cat to see through. If there is a chance that your cat can't see through the mask, enlarge the eyeholes with a pair of scissors. A costume that fits well should fit your cat from neck to tail, without going past the end of your cat's rear end. So, basically you want the costume to lie from the base of your cat's collar to their rump, just above where his tail emerges from his body. If your cat is not comfortable in his costume, don't force him to wear it for too long a period of time. I would not suggest using any of the dye products that are on the market for coloring human hair for Halloween, as they could be toxic to your cat. Check at your local pet shop or groomer to see if they have anything suitable. If they don't and if you are determined to change the color of your cat's fur, check the mail-order pet catalogs or pet product websites, as there are products specifically made for pets that are not toxic to them. Halloween can and should be a happy holiday for all the members of your family, not just the human contingent.